The Boucherie method or process for treating bamboo poles looks like a complex method at first blush. With a little thought, however, it can be a simple and straightforward way to protect bamboo from insect infestation and greatly extend the life of bamboo poles. Simple searches on the Boucherie method commonly turn up treatment methods calling for an air compressor. But we don’t all have air compressors in our sheds. Also, after spending a day along side the innovative Lance of Bonza Bamboo, I have learnt that the initial set up of a Boucherie treatment process with an air compressor can be fraught with unexpected glitches compared with a simple gravity fed system. 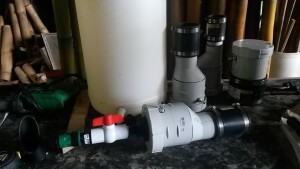 This post describes a simple modified Boucherie treatment developed by Lance using gravity and readily available garden and plumbing fittings. Firstly, decide on the preservation liquid you want to use to replace the sap in the bamboo with. Lance uses an easily dissolvable form of borate (disodium octaborate pentahydrate). You might like to experiment with the Freemite product that was demonstrated in at Byron Bamboo last month. Thirdly, set up a drum, with a garden hose attached to it, at height. The drum will hold your chosen preservation fluid. The height will dictate the pressure you can achieve, and thus the time it takes to displace the sap. Janssen, in his book Building with Bamboo: a handbook, (on Amazon and eBay ) suggests that a head height of 4-6 metres is adequate to get the preservation liquid flowing. Lance got about 6 ½ psi at a head height of about 5.5 metres. (This happens to be the reachable height from a ladder in the loft of his shed). When this is all ready to go, cut the bamboo you wish to preserve. Fresh is best. 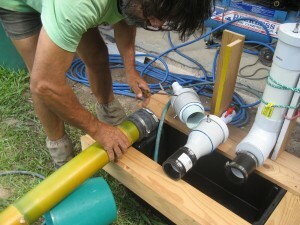 Attach the hose from the drum to the manifold and attach the manifold to the bamboo. Then wait. Yes, it’s slow, but you can walk away from it without fear of blow-outs, poles blowing over in the wind, or anything else going awry. 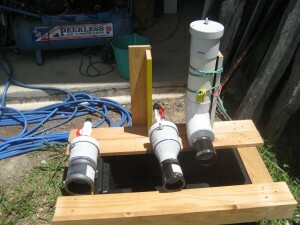 The system is easily expandable to treat up to 10 poles from the one raised drum. On the day I followed Lance around his shed, it took about five hours to treat a four-year old, 4 metre length of B. oldhamii with a diameter of about 95 mm. This entry was posted in All, Building and Home Renovation and tagged bamboo, treating bamboo on 12/02/2015 by Deb.